A Jaguar Crossover! Let's all wait a few seconds to let that sink in. Well truth be told, we've all known it isn't a derivative of fiction. We've even seen it unveiled at the Frankfurt Motor show and then at our very own New Delhi Auto Expo earlier this year. There've been so many doubts, questions, and concerns since then about a Jaguar crossover, but now, the wait is over. We've finally gotten our hands on the Jaguar F-Pace in thesmall sovereign state and very unlikely location of Montenegro. And as I press the stop button, step out of the car and admire it against the sun disappearing into the Adriatic after a day of satisfying my curiosities, I realize the wait has been worthwhile. Read on and it'll satisfy yours too. So it's a Crossover? But WHAT IS the F-Pace? Jaguar has an elite faction within the four (or more) walls of its manufacturing facility called the F-Section that practices a modern iteration of alchemy, albeit using Aluminium, and they come up with special products like the F-Pace. It is in fact the 3rd car to be built on Jaguar's new Lightweight Aluminium Architecture following the XF and the XE. With it, Jaguar aims to gather attributes from other cars in the portfolio  not just the F-Type's stunning design and performance, but also the XE's value and accessibility, and the XF's technology and brand image. Top that with the practicality offered by the crossover body type  shake don't stir  and voila we have anattractive concoction. But having said that, more than 80 per cent of the parts on the F-Pace are brand new. So it uses Aluminium. What's the big deal? No other manufacturer uses Aluminium as extensively as Jaguar because despite its evident benefit of weight and strength, Aluminium is extremely hard to shape and work with. The body panels need to be stamped at once because Aluminium isn't as malleable and it can only be stretched to a certain extent. The minimum radius you can achieve at the edges is 12mm. So I like the fact that Jaguar persists with Aluminium and has learnt and adapted to overcome these challenges. And 33 per cent of the Aluminium used is recycled. The result is that the entire body structure weighs in at less than 300kgs  roughly the weight of the body structure of a Fiat 500L. Can a big brute have the design flair of classic Jaguar sports cars? The design has very obvious similarities to other Jaguar cars, especially the F-Type, but Jaguar Design director Ian Callum is anything but apologetic about it. The first design mandate for the team was to make it distinguishable as a Jaguar from 200 metres away. The one dimension that is the most unfamiliar for Callum and Jaguar cars is the height of the vehicle. They also wanted to keep the overhangs as short as possible and push the wheels to the corners. They managed an overhang of just 834mm at the front while catering to crash norms thanks to the use of high strength Magnesium in the front end. 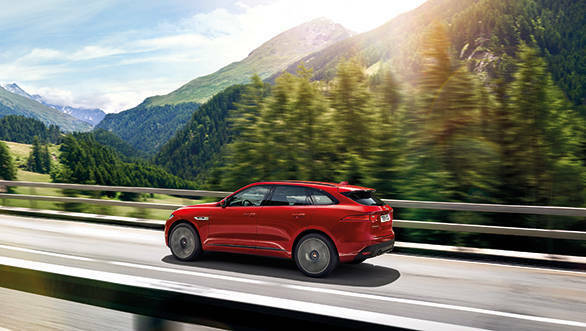 The bulge on the bonnet is reminiscent of the 1968 Jaguar XJ while the taillights are akin to ones made famous by the F-Type, and the E-Type before it.The silhouette of the F-Pace has been designed with the intention of achieving sports sedan like aerodynamics and a drag co-efficient of 0.34. Unlike the Audi Q5 or even the Porsche Macan, the F-Pace looks longer and shorter. Ian Callum insists that the long bonnet is not as much due to the longitudinal gearbox as much it was a design mandate. The F-Pace also manages a class-leading wheelbase and ground clearance of 2874mm and 213mm respectively. Will I feel like James Bond getting inside the car? Actually, on the inside the Jaguar F-Pace is surprisingly simplistic. It doesn't quite have the flamboyance of the F-Type or the richness of an XF. Instead the focus has been very heavy on improving practicality of the cabin. There are of course a few design cues and lines however that have been retained from the interiors of the CX-17 concept as well. Jaguar has worked very hard to create a large number of storage areas  13 in number. Can all four of my friends fit in on my Goa trips, or will one want to get off half way? The ergonomics have been optimised for maximum space of which there is plenty in both rows of seating. It has legroom of 944mm and knee room of 65mm in the second row  almost identical to the Audi Q5, and that's impressive. The rear seats are higher by 10mm than the front to allow the rear passengers a better view of the front. The front seats can be adjusted in as many as 14 different ways so finding that right driving position will not be an issue. So yes, not only can 5 people travel long distances in comfort but their large vacation-luggage can also be easily accommodated. 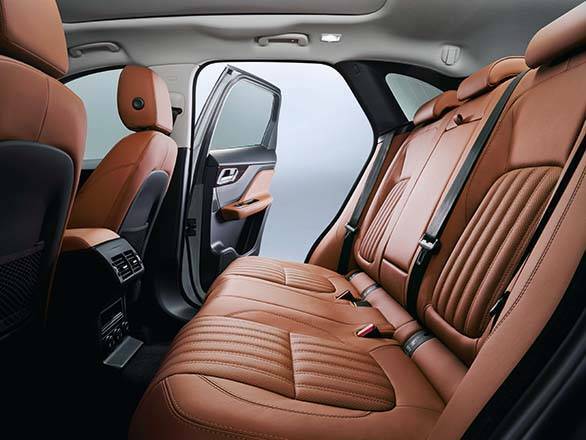 Bootspace stands at an impressive 650 litres and that can be expanded to 1740 litres with the second row dropped  and that's a first that longstanding Jaguar loyalists will definitely be thrilled about. But it's gotta have its frills and fancy bits, right? It does, loads. The F-Pace's instrument cluster is a handsome 12.3-inch, full colour, TFT screen that can be customised completely to display exactly the information you want it to display in four different themes. It also features a four colour lazer head up display. On the center console, the F-Pace boasts of what's claimed to be the world's best infotainment system  with more processing power than a Boeing 777. It's called the 'Ín Control Touch Pro' and it makes the F-Pace what Jaguar reckons is the most advanced car they've built. It features a Quadcore processor, a 100GB Solid State Hard drive, 1Gb/s ethernet which can connect as many as eight devices at once using a WiFi hotspot, a 10.2 inch touchscreen and a 825Watt 17-speaker Meridian music system. But it is really the software that's most impressive. It doesn't have the sort of gesture recognition that we've seen on the new BMW 7 Series but it has unrivalled smartphone connectivity. You can access the climate control, start the engine, lock the car  all from an app on your smartphone or even a smart watch. It also has a social media integration coupled with voice recognition so you can tweet while driving, not that we advise you to.The navigation is also extremely intuitive and not only does it have a street view feature but it can also send someone your ETA once you feed in the location. But the highlight has got to be the 'Activity key'. Wait, no way! Like a wearable key? Say you're out on the beach, or the swimming pool: What do you do with the key? 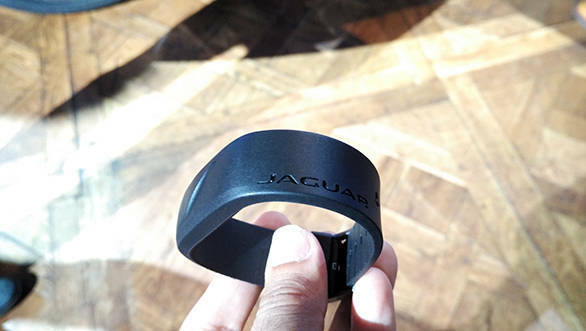 Well, Jaguar have debuted a wearable band, waterproof to a depth of 20 metres, that doubles as a key. You simply leave your car keys inside, walk to the back of the car and touch the Activity Key to the J- letter on the rear badge. It locks the car and disables the normal keys. Afraid of break-ins or malfunctions? The band uses the tried and tested RFID technology that keeps your credit cards safe. Once you come back from your swim, you simply repeat the process, the car unlocks and your key is active. When the F-Pace is launched in India, Jaguar is likely to give the majority what it wants  diesel powertrains. So the F-Pace will drive into India with a 2-litre and a 3-litre diesel engine. Sadly, at launch India will be devoid of any petrol F-Paces. Now I say sadly, but I don't really feel too bad for us lot. In absolutely no circumstance does 300PS of power and a massive 700Nm of torque sound less than adequate in the Indian context. You'll get to a 100kmph from standstill in 6 seconds only to realize you're borderline breaking the law. Thankfully, the breaks are great. Because the car is so light it manages to outpace expectations, whilst not being as avaricious for fuel as its petrol counterparts. It will match your enthusiasm every step of the way, also thanks to the brilliant ZF 8-speed automatic gearbox that does duty so ably  it'll put doubt over the need for other gearboxes. ZF also does a newer 9-speed automatic but that isn't ideal for the massive torque and the F-Pace's torque-on-demand requirements. 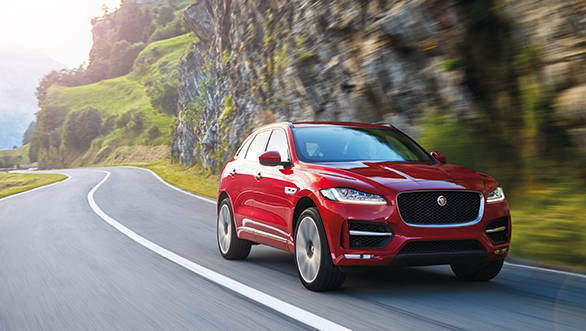 The 3-litre feels exceptionally refined for an oil burner and Jaguar claims they have managed to make the F-Pace's cabin quieter than the Macan's by about 6 decibels. Now, it is almost certain that after having driven the 3-litre before the 2-litre diesel, you will tend to expect too much out of the smaller engine. And I have to admit; I could immediately gauge the difference in performance. The gearbox does try very heard to keep the engine eager and enthusiastic and as a result you'll notice that it is always on the boil in comparison to the V6, which feels much more at ease. Consequently, the noise from the hard-revving 2-litre engine also does make it inside the cabin. But when the Ingenium gives you a fuel efficiency figure of 18.86 in a car of this size, most of you will not be complaining. The big question! Does it drive like a Jaguar? Big astounding yes! You have to drive it to believe it. It feels like a slightly raised XE to drive  it's not as soft as the XF. And despite the slightly higher centre of gravity, the active dampers work brilliantly to counter roll in corners and diving under braking. It handles with the agility of a much smaller car, and like the Macan, it inspires more confidence and excitement than most sedans. Under the dynamic mode, you can set the suspension, steering, gearbox and engine response to either normal or dynamic. While the change in powertrain response is palpable immediately, it will take you some driving to understand the difference between the two settings for suspension and steering. What it tells you is that essentially the set-up is just right and doesn't need meddling with  no matter what conditions you're driving in. how naughty can you get with the F-Pace, if you know I mean? Despite the F-Pace having been designed to be a rear-wheel drive configuration with all-wheel drive capabilities; the traction that you get out of corners is incredible. You'd have to really get it very wrong or very right to cause wanted oversteer. But so much is the emphasis on it handling right, Jaguar's even contradicted their own emphasis on practicality, as you'd imagine a front-wheel drive to be more efficient and a better layout for interior space management. But since they didn't want to compromise on the dynamics of the F-Pace, it was always meant to be rear-wheel driven. The suspension system doesn't manage all this by itself. Underpinnings on the F-Pace are double wishbones with bonded bushes and strengthened lower arms  these ensure the F-Pace is 35 per cent stiffer laterally than the Porsche Macan. 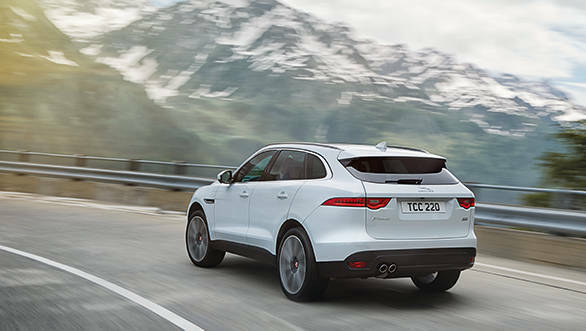 It also uses passive monotube dampers with Jaguar's adaptive dynamics, which allow you to electronically optimize the dampers and adjust the suspension in four ways. The all-wheel drive system uses a chain driven transfer case, which is just eight kilograms heavy. 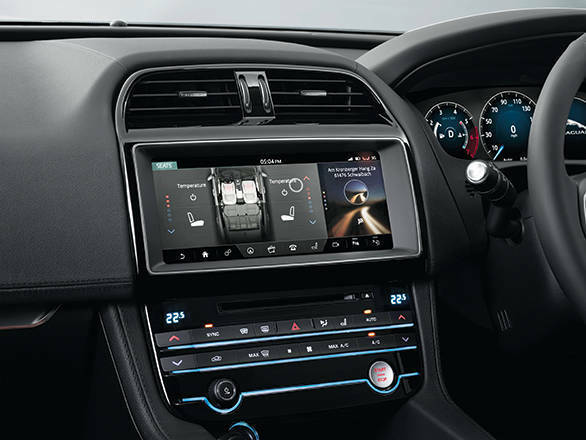 There are a host of electronics on board as driver aid like Intelligent Driveline Dynamics or IDD (Jaguar lingo for Traction Control), All Surface Progression Control or ASPC (Jaguar's rendition of Land Rover's Terrain Response), Adaptive Surface Response or ASR, and 12 other camera based driver assistance safety systems.The Jaguar F-Pace is steered by an E-PAS system, which is the same unit as on the F-Type and it is one of the better ones I've driven with just the right amount of weight. So the F-Pace shows ably that practicality doesn't always have to come at the cost of driving pleasure. What's the F-Pace got to contend with in India? Jaguar admits that the closest competition to the F-Pace is the Porsche Macan but it also aims to match, if not better, the practicality and space offered by larger SUVs like Audi Q5, and even the BMW X5. Priced in the UK at 34,000 pounds, the F-Pace is similarly priced to the Audi Q5 and is a hefty 10,000 pounds cheaper than the Macan variant for variant, and in India that is bound to magnify further considering Porsche's gone all out premium with the Macan. Will Jaguar go the Porsche way? I think that would be a terrible mistake. 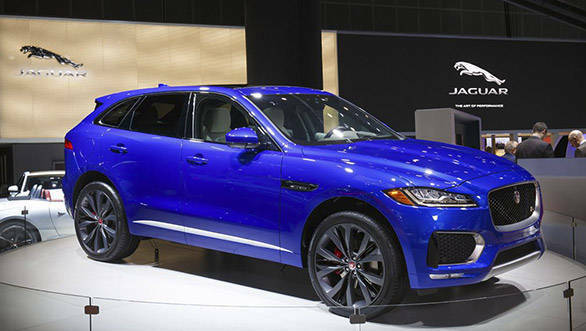 But if they manage to price it in the same ball park as the Audi Q5, and remember the Q5 is assembled in India, this might just become the most popular Jaguar in India.